Excellent product, good price, quality seems outstanding. The instruction manual is wretched. Read full review for help in installing. 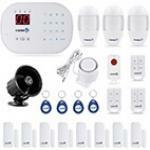 Fortress Security System Installation 2018.09.24 Overall Recommendation This is a fine alarm system, that does everything I need or want, and the price is right. The quality as delivered is also first class. The installation is interesting primarily because the instruction manual is wretched. As delivered the product quality appears to be first class. I found a few problems or recommendations which you can find at the end of this document. Support through this installation process via email and telephone has also been above expectations. I recommend you purchase a system like this and purchase a monitored system. Our local police department recommendation is to get the loudest alarm you can. If the monitoring company calls you and then the police, the bad guys are long gone. What you want is an alarm loud enough that the bad guys take off, and your neighbors call the police. Or you can call them when you get the alarm signal. We have literally had the neighbors call the police before we could. The cell phone technology in this system can contact you and allows you to call the system even if your power and internet are down. The device has a battery backup internal to the main device. Even if the bad guys cut the power and telephone line, it should still operate and notify you of the breach. The instruction manual is a disaster. I found it very confusing. So I put together my own step by step – just in case I ever need to do this again, and I thought others might appreciate the help. Fortress Support might also find it useful. Installation Instructions 1. Unbox it all. Count the parts, make sure you have them all. I got them all, and the packaging is beautiful, but just be sure. I found one error in the units – see below. 2. Central Unit. They call it the “Main Panel”, but there is no panel. It is a lovely little gem. First thing, look at the buttons on the device, and keep a picture of them in front of you while you are installing things. I got mixed up a little. a. Central Button – this is the big button in the middle with the glowing lights. It can arm the device. It also changes color for status indication. b.	Wifi button – the far left one. You use that one to connect the device to wifi. c.	Set Button – the one in the middle. That is the trigger for doing other things, such as installing additional devices. d.	Power Button – far right one. It is used to power off the device when you unplug it and want to disable it. It is also used in combination with the other buttons to terminate functions. 3. Position the Central Unit There is a little plastic bracket in the package which you can attach to the wall, and then connect the unit to it – but there is NOTHING on the device which allows you to attach the bracket. I see a picture in the manual of a different model where that bracket is attached to something. There is a 3M sticky strip if you want to permanently attach the back of the panel to the wall somewhere. I would not recommend that. Choose a spot near a power outlet, and plug the device in NOW. The power unit is a standard USB power port, which is a great idea. Let it charge the battery a bit before moving it around. The central unit has a battery for backup, but it has almost nothing in it as delivered. 4. 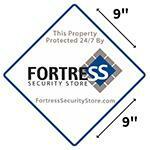 Get the APP –“My Fortress”. It is essential to do anything, so get it now. Get it from the App Store or Google Play. I have not had any problem with the APP. 5. Open the APP a. Sign in and give it a real email as everything that happens from here on out goes to that email. b. Choose a password. I used the same password for the Fortress site – probably not a great idea, but . . . They also use Google to sign in at the site as an option. 6. Connect APP and device. With your phone connected to the wifi, use the app to scan the QR code on the back of the central unit – this is the “bind code” for the device. The pictures in the manual are often for some other device – do not be misled. This connects the APP to this device. 7. Connect the device to WIFI. This is in the manual somewhere, but not in this order. Do these steps: a.	Connect your phone with the APP to your wifi. b. 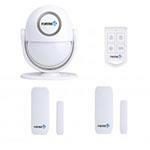 On the device, press the wifi button for a few seconds – the unit will say: “wifi smart configuring”. Having a voice response is very cool, given that the device has no screen. This sets the device searching for the APP on the wifi. c.	In the APP go to management / wifi / smart config. That gets the APP looking for the device. Enter the wifi password where it is prompted, and press the Config button, then “Start Config” – that should get a “successful” message from the device. d.	Ignore the little red message that says “5 G router is not supported.” When I tried this the first time, stumbling through the opaque instructions, I almost threw a fit. It didn’t work, and there is that message telling me that my router is not supported. WHAT! Why didn’t they say this on the product specs. Mr. 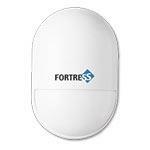 Fortress and company, please remove that message unless you detect a 5G router – whatever that is. 8. Activate the GSM SIM card. Once on wifi, the APP will be notified if the alarm is breached via the internet. I honestly do not know how the APP gets to my cell phone remotely, but it does. I asked support for the details, but could not get a good answer. . But I can control the alarm remotely the same as on the local wifi, without using the GSM SIM. If the internet is down, either because someone cut the line, or the power is out, the system will use cell technology through the GSM SIM to call and / or text to the telephone numbers you store. The SIM card should already be inserted into the slot on the central unit. Since there is no standard phone line, the GSM SIM provides telephone connection. They seem to use different carriers for different locations. The SIM I got had no coverage at all in the location where I am using the alarm. I think they select the carrier based on your mailing address. You can purchase a SIM elsewhere, but it has to be a GSM SIM for the phone technology in the system. Verizon for one, does not support the GSM network in the US, so their card will not work. a. Go to the Fortress website to activate the SIM card. 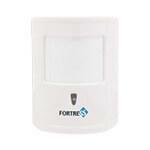 https://www.fortresssecuritystore.com/activate. Or you can use the QR code in the manual which will take you to that URL. b. Find the SIM card holder that came in the box with the central unit – the SIM that is inserted into the device was a part of that card. c.	At the website, select “activate SIM”, and enter the last 5 digits on the SIM card holder, and give them a credit card. Go to “complete order”, and they will send you an email with the telephone number of the SIM card. d.	On the APP, go to Management / select the device name / Edit Device Info. Change the telephone number there to the SIM number. Be sure to delete the 4 zeroes that are there – otherwise your number will be invalid. And be sure to SAVE before you exit. Storing the number will let the APP call the device through your phone. You can also call the device on any regular phone. e.	Put that number in your contact list, as that is how you will be calling the alarm. f.	I cannot get my alarm to answer a call. It tells me that the subscriber has moved outside of the range. I discovered that mine is a T-Mobile number, and I have no coverage here for that carrier. 9. 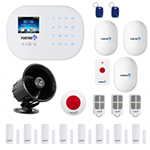 Set Security for the Central Unit. When you call from outside, you will need to enter a password on your phone. The administrator password is 6 digits, and the “other” user password is 4 digits. a. In the APP, go to Home. b. Go to Management. c.	Select Security. d.	Select Device Password: Admin and User passwords. SAVE them, and back out. e.	Store Contact numbers in the Alarm Contact list. These are the only numbers to which the alarm will respond, and these are the numbers it will call and text when the alarm is activated. My Fortress / home / management / Contacts. Be sure to save them. 10. Set Panel Settings. a. Delay – I would set the delays both to zero, unless you want to allow a few seconds for the person entering to disarm the system. Since you have a remote for that, no need for any delay. b. Arm / Disarm SMS – set this to get an SMS for every arm / disarm / arm home event. c.	Power Battery Notices – This is a very nice feature. You can select how you want to be notified. Personally, I would NOT select the siren feature when the panel is turned OFF. If someone is right there and can use the button to turn it off, and even knows how to do that – I do not need an alarm. d.	Siren and Ring. GSM Ring sets the number of rings before the device answers a call. I am curious why that is there – there is no way I can answer before the system picks up. e.	Volume – Key Tone sets the level of sound for the buttons on the device. That probably makes more sense when the “panel” has a keyboard. 11. Add Door Sensors. The first step is to test everything, but you cannot do that until you have the system up and running, on wifi, and connected to your APP. a. Test the Sensor first. I used to put everything in place, and then connect them. The manual suggests testing them, and then installing them. Excellent advice. The manual suggests you ARM the system and then trigger the sensor to make sure it works. You can also set all the sensors to “chirp”, and test them that way, as the CHIRP sound is quite loud! You can also look in the APP for the number of each sensor and match it to the QR tag on the sensor. That actually seems the easiest way to identify them. b. Clear a space for all of the tested sensors before you put them up. You may need some space, and mark the box or something with the number of the device as you learn them. c.	Arm the alarm – this is going to be noisy, so take the siren out of the wall for now if you have plugged it in. d.	Take sensor out of box. Leave the 3M sticky pads in there. e.	Pull the strip that is protecting the battery so the unit will start operating. f.	Trigger the sensor. Note the number which the alarm sends to you for the triggered device. g.	Disarm the alarm. h.	Put the sticker for that number on the sensor. Put that sensor back in its box, write that number on the box. Line them up in order. i.	Repeat for all sensors. I only need 4 door sensors right now, so I stopped at 4. No sense in activating the others just to have lie around and use up that priceless battery. 12. 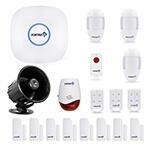 Identify Motion Detectors. This is a slightly different problem. a. Take sensor out of box and its nice little bag. b. Check in the APP – most likely the sensors are already added, you just need to identify which one is which. Go to ‘sensors’, select one and look down at the bottom where you could scan the R code. Compare that number to the motion sensor QR codes. If you are installing new ones, that is the spot where you scan the QR code for the new sensor. One of my motion sensors was the WRONG one. A different one had been installed at position 0 – a position I did not know existed. I deleted the wrong one and installed the one in the box – which then went to position 11 – where there was a door detector – that might get interesting. c.	Turn the Motion Sensor ON. Before you put the little support plastic thing on the back of the sensor for the ball connector, turn the sensor on. There is a tiny slide switch up there where the plastic support slides in – turn it to “on”. It is clearly marked. Another item NOT noted anywhere in the documentation. Test each one, either with the “chirp” or by arming the device. d.	If you have to add a device: Press the SET button on the device for 3 seconds and it will respond “adding remote”, press it again to “add sensor”. Then activate the sensor. When you are done adding sensors, press the OFF button to end the installation phase. Those steps are clearly spelled out in the user manual. You do not need to scan the QR code on the sensor. That must be there for a different system. The APP also has a place to add a sensor under App / Home / Sensors –see the little PLUS sign up on the right – select that. That PLUS sign should be a prompt – it might save a bit of confusion. But NOTHING happens. I suspect this is in the APP for a different system. 13. Put Sensors in Place. a. In the APP, change the name of the sensors after they are in place. That way you don’t need to refer to the list when it calls or texts! b.	App / Sensors / Name / Save – c.	Write them all down someplace as well. 14. Other sensor options. These are not explained anywhere I could find. a.	Siren. Set this ON if you want this sensor to trigger the siren. I guess you might have need for a silent alarm on some occasion. b. Delay. I originally set all of these to 0, but my motion detectors were “chiming” of and on all night, which led me to believe that they are VERY sensitive to heating air motions. So I set those up a bit. I set them to1 second, and that seems to work. You might set the motion sensors to “chime” for a day or so while you are there, and see if they are triggered by the air currents. c.	Chime. Set this ON if you want the sensor to “chime” every time it is triggered, even if it the alarm is not set. This is a nice feature for doors if you want to know when the little ones wander outside. It is also handy that it can be set for each sensor. The only problem here is that the sound is not exactly a “chime”. For a door sensor, it is a voice alert that the door is open or closed. For a motion detector it is a not so gentle klaxon! Quite unnerving in the middle of the night if someone is moving about. d.	Ready. Set this option ON if you want the device to prevent the system from being armed if the sensor is not on and ready, as when a door is open. This is handy, as you do not want to arm the alarm if you forget to close the basement door! The good news is that if this option is OFF and a door is open, the system will arm, and if you later close that door, it will work just fine. 15. Install the Black Siren. 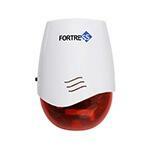 This outdoor siren is one of the better things about this alarm. We have had a few break-ins in the past, but they were short lived because the outdoor siren is so loud, the neighbors called the police and the bad guys disappeared. Installation here is another interesting event. a. Mount the siren – I put it on the outside of my garage, and drilled a hole through the wall so I could run the power cord to it. b.	Unplug It and plug it back in three times in fairly rapid succession. It will beep with each plug, and on the third, it will emit a different sound, meaning it is now installed. c.	There is a video on installing the Black Siren, but it is for a different system. 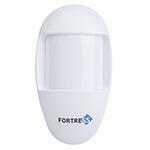 Go to this URL: https://www.fortresssecuritystore.com/videogallery. Page down a bit, select “more” a couple of times – you will eventually find it. Your siren should already be installed – you just need to do the unplug, plug thing to get it to work. It would be nice if the videos could be easily searched. You are better off going to YouTube and searching for them there. 16. Worth Noting a. You can arm the system with doors open if the READY option is off those sensors. It will not complain. It will let you close them as well without triggering an alarm. b. Add Door width. I had problems with the door sensors because the frame by some of our outside doors is quite thick, and the door is inset. I could not get the sensor on the frame close enough to the magnet or trigger on the door. I put a block of wood on the door to push the magnet out far enough that it encounters the sensor when the door is closed. It looks odd, but no one ever looks up there – don’t worry about it! Problems / Suggestions 1. “Welcome to your Fortress System”. The device keeps saying that. It woke me up at 6:30 am with that little greeting. I suspect it is responding to very short power outages in our rural area by announcing that it is now awake. It does not send a power outage text – so I think this is an official BUG, not a feature. One option is to turn the volume way down at night. I notified support, and I guess it will eventually be fixed. I assume they can update the software remotely. 2. “Chime” is a klaxon or voice response. If you set a sensor to “chime”, it will generate a sound whenever anyone triggers it, by walking in front of a motion detector, or opening a door. The “chime” sound is either a voice message – door # opened, closed – or a klaxon sound. The latter is quite loud. A gentle chime would be nice. But at least you can turn them off by sensor. 3. There is no landline port into the system. I had downloaded the instruction manual and assumed that there was a landline port because one is mentioned in there. There is NONE. Either you use your wifi and internet connection, or the cell SIM. 4. The manual is a nightmare. You need BOTH the device manual and the APP manual. There is NO logical structure to the manual. The instruction book appears to be an amalgamation of text and pictures from older models and some new additions. 5. The APP runs in Apple iOS, and I assume in Android. It does NOT run in the Fire Android. Not clear to me why – Fortress - I would FIX THAT. 6. The APP lets you make a change, and then leave that function without saving it. So be sure to SAVE things before you exit the function. 7. The GSM SIM provided was for a carrier that has NO coverage where I am using the alarm. I requested and received a rebate. In fairness, my mailing address is different from the location of the alarm, and they probably sent the best one for that address. My suggestion – ask the customer where the device will be installed and send a SIM with the best coverage. 8. The batteries in the door sensors are those little 5 V things. They are hard to come by and expensive. But they say they will last 3 years. The sensors will text you if the battery is getting low –a nice feature. Couldn’t you get the electronics to work on AA cells? And getting those little buggers out of there should be interesting. You nearly have to disassemble the sensor. The motion sensors have AAA batteries, which should be replaced every year. I would add a description of the batteries to the manual, and the replacement guidelines. 9. Magnetics are inside the sensors. That means you have to precisely locate them next to the door. One was much less sensitive than the others. I had to get it really close. The others had more range. My old alarm had sensors with the magnetic thing connected with wires, so I could put the sensor inside a warm house, and locate the magnetic strip outside the house on a storm door. Cannot do that with these guys. 10. Support is not available weekends. I am quite sure the site and manual say that. But they did call me early Monday morning, and were very helpful. 11. App Suggestions. a. Warn the user when leaving a function that has changed without SAVING. b. Remove the little red warning about no support for a 5G router, unless you detect a 5G router. c.	Provide a “delete history” function. I now have tons of things sitting in there that I do not need. Ordering and shipping were good. Setup of wifi is a different story. In the My Fortress Mobile App Manual on page 16 step 4 shows a character that is not on the panel - should be an asterisk. I suggest a more detailed step by step instructions with screenshots. You also have several references in your instructions to press and hold the WiFi button on the controller. The S03 does not have any buttons on the unit that resemble a WiFi symbol. Is it disguised or does it not exist? Later today I will attempt to add my wife as a user. I am not finding instructions to have the system send me an alert on my cell phone either through the app or a text message rather than the system having to call my phone. Does the system only send out alerts through a landline phone? Where are the instructions for disarming the system when it calls you? A very well-thought-out website and ordering process.